Keep your weekly plans and get your entire class outdoors as often as possible with our Splash & Play Suit. They have a lightweight construction that offers showerproof protection for babies and children up to 5 years old. 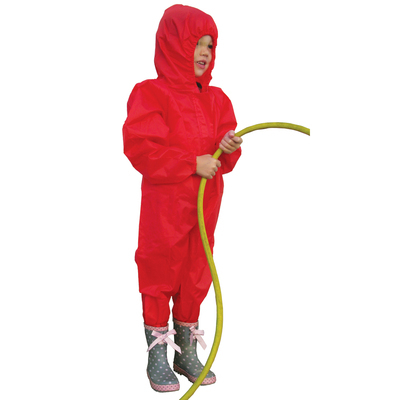 Each suit features elasticated cuffs to keep wayward water from reaching sleeves along with an elasticated hood to lock it in place. Tapered seams and a sturdy zip further help to prevent leaks with adjustable underfoot straps that prevents the legs from rolling up during wear. Perfect for both holiday activities or school playtimes, this play suit allows them to play to their heart's content without soiling their clothes in the process. Underfoot straps to prevent rolling up. Dimensions: - 18 months (90cm height), 2.5 - 4 years (100cm height) and 4 - 5 years (110cm height). Here at Gompels, our Playtime collection is stocked full of items to help create the most engaging sessions in your classroom. From our classic Abacus through to our Early Years Police Costume, you'll find something here to inspire every student.